Many changes occur in the fruit as ripeness progresses from the mature green stage to over ripeness. Fruit color develops from green to yellow and in many varieties, the skin develops red or purple color. Fruit size increases, and flesh firmness decreases. Flavor changes from tart to bland, and sweetness increases as fruit ripen. Since these traits define fruit quality, the stage of ripeness impacts consumer acceptance. The change in these qualities can be used to determine if fruit are at a good stage for picking. Plums and peaches also hold up better during cold storage and marketing if picked at earlier stages of ripening and will continue to ripen. When fruit are marketed locally and within days of harvest, they may be allowed to ripen on the tree to improve flavor. Sweet cherries do not continue to ripen once they are harvested, and should be picked at peak quality. Cold storage and other postharvest techniques slow down the progression of ripening and can counteract the natural loss of quality. For many apple varieties, the expected storage duration depends on ripeness at harvest. Apples picked at the mature green stage can be cold stored up to 4 months if conditions in the orchard and in storage are ideal. However, most summer-ripening varieties can only be stored a few weeks without losing quality. Fruit picked after some ripening has occurred can be kept in cold storage for 2-3 months depending on the variety. Once they are fully ripe, storage life of apples is limited to one month or less depending on temperature in cold storage. Over-ripe fruit will not keep in good condition with or without cold storage. Stone fruit can be held in cold storage, but for a much shorter duration of two to three weeks. Most fruits produce a gaseous compound called ethylene that starts the ripening process. Its level in under-ripe fruit is very low, but as fruit develop, they produce larger amounts that speed up the ripening process or the stage of ripening known as the “climacteric.” The level of ethylene and rate of ripening is a variety-dependent process. Some apple varieties such as McIntosh, produce prodigious amounts of ethylene and are difficult to store once this occurs. When harvested after the rapid rise in ethylene, they quickly soften and senesce in storage. Other varieties have a slower rise in ethylene and slower ripening rate. For apples that will be stored longer than two months, it is imperative to harvest them before the level of ethylene begins its rapid increase. Plums and peaches are also sensitive to ethylene and will continue to ripen after harvest in response to this hormone. Some varieties of plums, such as Shiro, ripen very slowly since ethylene production is suppressed. With these suppressed-climacteric types, fruit may remain under-ripe if harvested too early. Other plum varieties such as Early Golden ripen very rapidly. In this case, harvest should be timed more precisely so that fruit are not over-ripe when they reach the consumer. To measure ethylene, expensive instruments are needed. This is often done by specialized labs and sometimes by Cooperative Extension to determine if fruit in a general region are still at a stage where they can be stored long-term. Cheaper methods can be used to measure stage of ripeness, but are not as precise as measuring the level of ethylene in fruit. Methods of controlling ethylene in fruit include preharvest application of aminovinylglycine (ReTain), postharvest application of 1-methylcyclopropene (SmartFresh), cold storage, controlled atmosphere storage, and ethylene scubbing or removal. 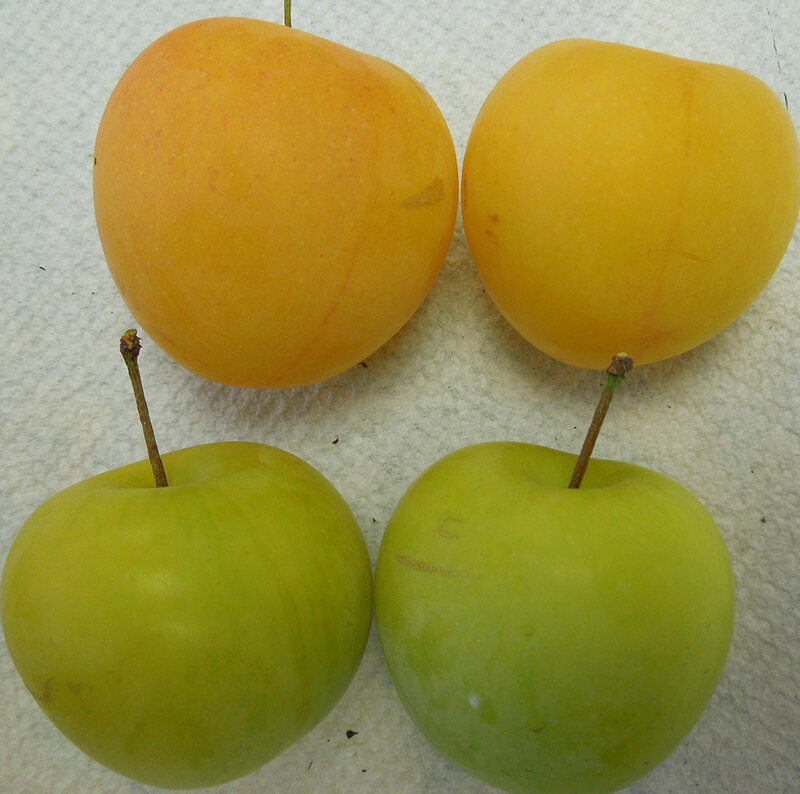 Skin color in ripe and unripe plums. Many apple growers use the change in seed color from white to brown. However, by the time seeds darken to brown, it may too late to harvest apples that will be store short or long-term, particularly the variety McIntosh. A dark seed color is usually a sign that fruit are ripe and ready to eat. It is a poor indication of when to harvest for storage. Ground color is a good indicator of fruit maturity for many varieties of apple, pear, peach, apricot and yellow plums. Areas of the skin with no red or purple coloration display the ground color or degree of green color. The skin contains chlorophyll which breaks down as fruit ripen so fruit display a change from green to yellow. 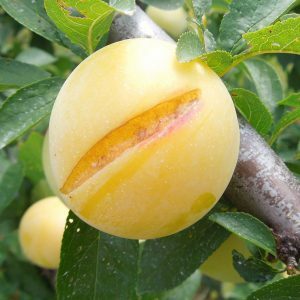 When the fruit becomes over-ripe, the skin can change to orange in the case of peaches and apricots. Yellow plums will change from green to yellow as they ripen. A few plum varieties will ripen very little after harvest and should be picked as close to ripeness as possible. Most varieties will rapidly ripen after harvest and should not be picked fully ripe, but with some green or light yellow remaining in the skin, the amount depending on how long it will take for them to reach market. Red and purple plums will develop additional skin color after harvest. 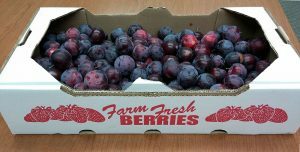 Some varieties of plum will develop a dark purple skin long before they are ready to harvest, and should be picked based on flesh firmness. Skin color changes in purple plums. The ground color of peaches changes from green to pale yellow and eventually orange. The optimum stage of maturity depends on the duration between harvest and marketing. For a longer duration, fruit should be picked at earlier stages. Where fruit will be sold immediately, some yellow color can be allowed to develop, but fruit could develop brown rot when allowed to ripen on the tree. The shade of light green or pale yellow that corresponds with optimum harvest depends on the variety. In the case of Cortland and McIntosh, optimum harvest date typically corresponds with a darker green than many other varieties. 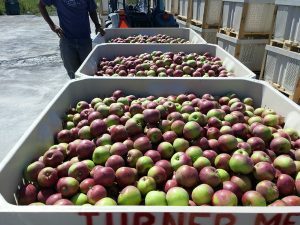 In the case of Honeycrisp, fruit picked when the ground color changes to pale yellow will hold up in storage if conditions are right. If picked at a green stage, fruit will develop bitter pit and will lack characteristic flavor. Ground color in unripe and ripening Honeycrisp apples. A useful test of maturity is the starch staining pattern of apples. The starch index test does not work for pears, peaches and other fruits. As apples begin to ripen, starch breaks down into sugars in the core first and then the cortex. Early stages of ripening correspond with starch breakdown in the core. As the last of the starch breaks down in the cortex, the apple is fully ripe and at a good stage for immediate sale. In most years, the beginning of the rise in ethylene corresponds with a certain level of starch breakdown that is characteristic of each variety. Heavy crop load reduces the amount of starch in fruit and can lead to poor interpretation of starch index. Iodine stains starch a dark color. Areas of the fruit that have lost starch will remain unstained. 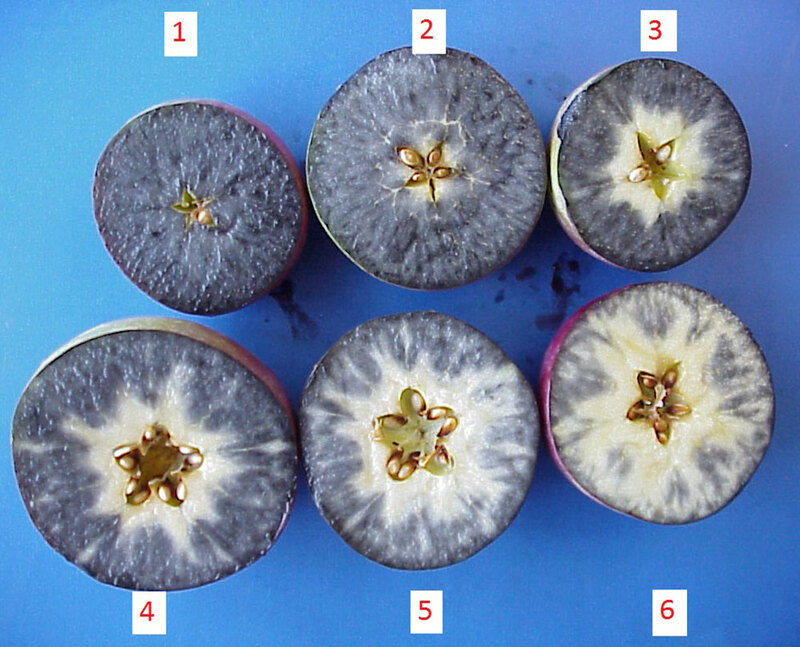 When a cross-section of an apple is sprayed with an iodine solution, a characteristic pattern of stained and unstained flesh occurs. The starch index is an arbitrary number that corresponds with a certain amount of starch loss. A commonly used index ranges from 1 to 8 with 1 indicating no starch breakdown and 8 indicating complete breakdown. Starch staining patterns in McIntosh apples. Starch staining patterns in Honeycrisp apples. The iodine solution, made from potassium iodide and iodine, is light sensitive and must be kept in brown bottles or containers that light cannot penetrate such as a squirt bottle wrapped in aluminum foil. When not in use, the solution should be stored in darkness. It should be mixed fresh at the starch of each harvest season for best staining. Mixtures left over from the previous season will stain starch, but not as well. To measure the starch index, select five to ten fruit from healthy trees with a crop load that is representative of the orchard. Slice each fruit half-way between the stem end and blossom end to expose the seed cavity. Squirt the cut surface, and wait one minute for the stain to darken. Record the index of each apple, and calculate the average. Compare your average index with a chart specific to the variety to determine if the variety has reached a stage for harvest. For commonly grown varieties such as McIntosh, the starch index that coincides with the appropriate stage of ripeness for short and long-term storage has been determined. New varieties such as Honeycrisp do not have a well-established index of when to harvest for long-term storage. In this case, a combination of maturity indicators should be used including ground color, starch breakdown and flavor. Starch index that corresponds with optimum harvest for short and long term storage of apple varieties. For pears, the most commonly used indicator of when to harvest is flesh firmness. When stored for a long or short time, pears should be harvested when they are still firm and green to prevent internal breakdown. Pears harvested ripe turn brown in the core after a short time in cold storage. Consequently, pears are picked before they are considered ready to eat, and when the flesh has reached a certain stage of firmness. The optimum firmness at harvest varies according to variety. Flesh firmness of pears that corresponds with harvest time for cold storage. Rain induced skin cracking in Shiro plum. Harvest timing of plums can be based on flesh firmness. 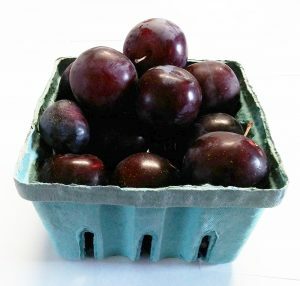 When plums will be shipped or held a short time prior to marketing, they should be harvested when flesh firmness softens to between 5 to 8 lbs. These fruit will continue to ripen and soften. If picked too soft, fruit that are stored or shipped will become over-ripe by the time they reach the consumer. Fruit that will be marketed quickly can be picked at a softer stage, generally 2 to 4 lbs. Most plums have a firmness of 2 lbs. or less when consumed. As plums ripen, they become more susceptible to rain cracking. The harvest of plums can be scheduled to avoid heavy rains if they have reach sufficient maturity. Methley plums that are harvested ripe are likely to crack in cold storage. 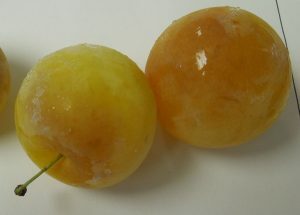 Flesh firmness of Japanese plums that corresponds with optimum harvest. 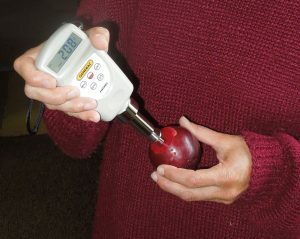 To measure fruit firmness, pressure testers typically have a tip for plunging into the fruit. The tip is connected to a device that registers the pressure on a dial or electronic screen. To measure flesh firmness, slice off a piece of skin. Plunge the tip into the flesh till it is submerged to the indicator line. It should take one full second to plunge the tip into the flesh. If faster speeds are used, the tester will give a high reading. If too much time is used to plunge the tip, false readings will also occur. Read and record the firmness on a representative sample of fruit, usually a minimum of five fruit. To measure apples, use the 11 mm tip. For pears, plums and peaches, use the 7 mm tip. Since dry fruit is less likely to develop decay in storage, harvest when the dew is off the fruit. To minimize bruising, remove bumps and holes in the drive row. Locate bins close to the pickers to reduce the walking distance. 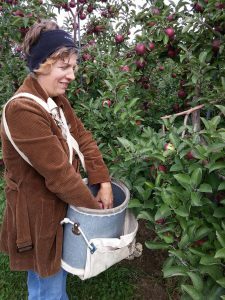 A picking bucket used for harvesting apples, pears, peaches and plums. The picking bag or bucket is the most common tool for harvesting and carrying fruit from the tree to the bin or box. They have adjustable canvas straps that encircle the upper body and arms and hold the bucket at chest height. To allow fruit to be emptied into a bin with minimal movement of the fruit, a canvas bottom opens when its straps are detached. They generally hold 1/2 to 1 bushel of apples and are adjustable. Padding on the inside can also reduce bruising. Considerable bruising can occur during harvest if pickers are not trained. Review picking procedures routinely. To pick apples, hold them with the palm of the hand using the fingers as little as possible. Finger pressure commonly causes small bruises. Fruit are more easily removed when the stem is snapped off by “rolling” the apple upward. The stem is more easily detached when it snapped in one direction than in the opposite, a practice that is best learning by experience. After picking, fruit should be placed in the bucket, never dropped. Minimize the distance that pickers use to can carry fruit to bins and boxes. Prepare the orchard floor by eliminating holes, ruts and other uneven ground. Set up the harvest and transport of fruit in a way that minimizes movement. A multiple bin or box carrier such as a flatbed trailer pulled by a tractor is a common method for moving apples from the orchard to the packing house or farm market. Apple bins on a flat-bed trailer. Fruit in a cardboard box for transporting and marketing soft fruit. Bushel boxes filled with apples. Quart-sized containers for displaying soft fruit. Cold storage is the primary method for extending the life of fruits. Apples and pears quickly soften and become mealy in texture when kept at ambient temperatures. To maintain the quality longer than one week, fruit must be kept in refrigeration. Apples and pears have the longest storage life of the tree fruits, and can be kept in cold storage up to four months under ideal conditions and up to 12 months in controlled atmospheres. Temperatures in cold storage range from 32 to 38ºF, depending on the chilling sensitivity of the variety. Most varieties can be stored at temperatures near 32ºF, but regular monitoring of room temperature is recommended to prevent freezing in rooms that do not maintain a consistent temperature. Honeycrisp is prone to chilling injury when stored at temperatures below 36ºF. Honeycrisp and other chilling sensitive apples should be stored at a temperature of 37ºF. Stone fruit can be kept for one to several weeks in cold temperatures, a duration much shorter than for pome fruits. Peaches, plums, cherries and apricots are susceptible to chilling injury. 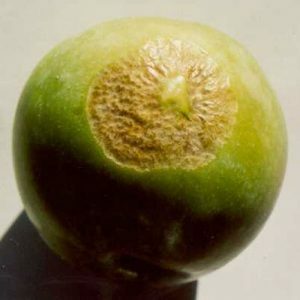 Symptoms develop more quickly when fruit are held a temperatures in the range of 36 to 40ºF, known as the “killing zone.” The flesh can become translucent, turn brown, or become mealy. To prevent chilling injury, store stone fruit at temperatures in the range of 29 to 34ºF. Cold storage rooms should be cleaned before use. Remove all fruit and bins to sanitize walls and floors. Bins should be sanitized, and be free of decayed fruit and debris. By removing sources of decay, the chance for fruit rot is lessened. Refrigeration units should be operable before the start of harvest. Ideally, they should be able to maintain a temperature near 32ºF (0ºC). For varieties that are chilling-sensitive, store fruit at temperatures in the range of 36 to 38 (2 to 3ºC). Fans should be operable and able to maintain air circulation. High humidity will reduce water loss and fruit shriveling which is common in Golden Delicious apples. If these conditions can be met, fruit will come out of storage in better condition. Recommended storage temperatures of tree fruit. Apple and pear flesh and skin can turn brown during storage. When browning occurs that is a natural process of aging rather than by infection from fungi, it is a disorder. Many types of disorders lead to loss of marketability, and vary with the relative maturity at harvest. Conditions in the orchard, such as fertility, and the variety can predispose fruit to certain disorders. In stone fruit, storage disorders are primarily due to cold temperatures and are grouped together as chilling injury. Bitter pit symptoms in Honeycrisp apple. 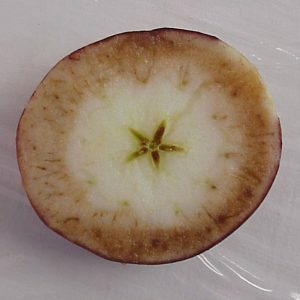 Bitter pit is a disorder that is partly caused by calcium deficiency in apple. It begins in the orchard, but the browning does not develop until after harvest. Small, sunken spots that are light or dark brown and located near the blossom end of the fruit are characteristic of this disorder. The browning can extend slightly into the flesh. Early harvest, high levels of nitrogen fertility, light crop load, and large fruit size increase its incidence. 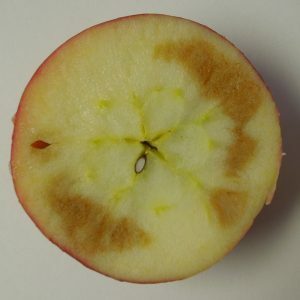 Honeycrisp is highly susceptible to bitter pit, so early harvest should be avoided in this variety. Jonagold, Granny Smith, and Cortland are also susceptible, but repeated foliar application of calcium products can prevent bitter pit in most cases. For Honeycrisp, foliar calcium applications should begin at petal fall and continue to harvest. Superficial scald of apple is a skin browning disorder that develops in some varieties when they are cold stored longer than three months. 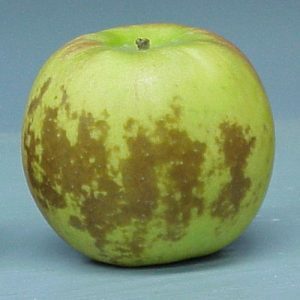 Brown splotches develop on the green side of the apple, and will continue to grow in size when the apple is held at warm temperatures. It is also associated with early harvest date. Cortland, Red Delicious, McIntosh, and Granny Smith are susceptible and should be treated with an anti-scald agent prior to placement in cold or controlled atmosphere storage. Diphenylamine (DPA), 1-MCP and ethoxyquin are scald inhibiting agents labeled for use on apple. 1-MCP is not effective for preventing superficial scald in Cortland, so this variety should receive DPA when stored longer than three months. Gala, Honeycrisp, Golden Delicious, Empire, and SnowSweet are not susceptible to superficial scald. Soggy breakdown symptoms in Honeycrisp apple. 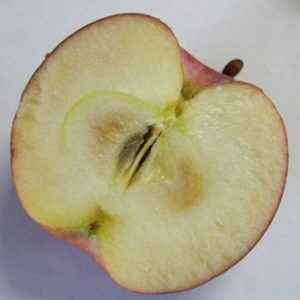 Soggy breakdown is an internal chilling injury that develops when susceptible varieties of apple are stored at a temperature below their tolerance. For Honeycrisp, temperatures below 37ºF can induce this disorder. Browning develops in the outer cortex. Severity of symptoms range from small brown spots in the cortex to a complete ring of browning around the entire apple that usually does not extend to the skin. There is usually ring of unaffected tissue just inside the skin. In Honeycrisp, it often co-occurs with soft scald. Conditioning the fruit before placement in cold storage does not consistently prevent soggy breakdown and in some cases, can make it more severe. It is recommended that Honeycrisp be stored at temperatures of 37 to 38ºF. Soft scald is a chilling injury disorder that occurs when susceptible varieties of apple are stored at temperatures below their tolerance. Soft scald develops first as a light brown discoloration of the skin. It may extend into the flesh and closely resemble a bruise. Eventually, fungal decay will occur in the affected areas. Severity ranges from small spots to nearly the entire surface of the apple. Honeycrisp is highly susceptible to this disorder and can succumb at temperatures normally used for cold storage. Other varieties that can develop soft scald include Golden Delicious and McIntosh, but this rarely occurs at temperatures that are commonly used for apple storage. Late harvest also worsens symptoms. 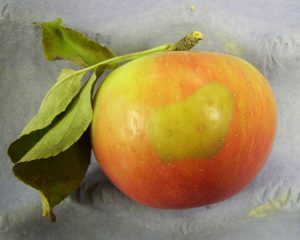 Soft scald symptoms in Honeycrisp apple at an early stage of development. 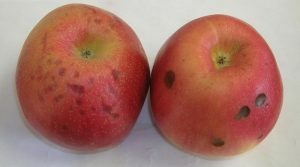 Soft scald symptoms in Honeycrisp apple at an advanced stage of development. Senescent breakdown in an advanced stage of development. Another consequence of late harvest is the loss of apples to senescent breakdown, an aging disorder. 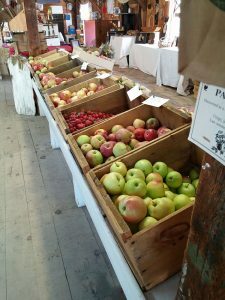 Some varieties, such as Macoun, develop it after a few months in cold storage whereas other varieties, such as Red Delicious, can be stored several months without an occurrence. However, all varieties will eventually develop senescent breakdown if stored long enough. Harvest at the right maturity for the storage duration, cold temperatures, and controlled atmosphere storage are the most effective methods of delaying its occurrence. Application of 1-MCP is also effective in delaying it. Lenticel breakdown in apple resembles bitter pit but is not isolated to the blossom end of the fruit. Brown circular areas develop over some of the lenticels. It is associated with a late harvest and long storage periods, but the exact cause is unknown. Honeycrisp is prone to this disorder. Firm flesh browning in an apple. Firm flesh browning occurs in Empire and McIntosh apples when stored for long durations at cold temperatures. It occurs more frequently with late harvest and the use of 1-MCP. Light browning occurs in the core and cortex. The flesh is discolored in a general manner with no distinct boundary between afflicted and healthy tissue. It is a difficult disorder to prevent since quality loss can occur if storage temperatures are above 35ºF, but the chance for browning increases at temperatures below this. The most effective method of prevention is harvesting at an early maturity for apples that will be stored longer than four months. Vibrational bruises can occur in some varieties of plum such as Shiro. 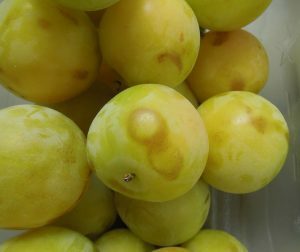 Shortly after transporting plums from the orchard, brown circles appear on the skin of sensitive varieties. When transporting plums from the orchard to the packing house or farm market, take steps to reduce movement of fruit in harvest containers. Chilling injury in stone fruit manifests itself in a number of ways. Flesh color can change from normal to brown and can become translucent. In some cases, the flesh becomes stringy or mealy. Vibrational bruising on Shiro plums. Chilling injury in Shiro plums. Diphenylamine (DPA) is an antioxidant that prevents superficial scald and can increase fruit tolerance to high carbon dioxide concentration that normally occurs in controlled atmosphere storage. Most varieties of apple treated with SmartFresh® do not require DPA for superficial scald prevention, but will have greater sensitivity to carbon dioxide in controlled atmosphere storage. After harvest, fruit can be drenched or fogged with DPA. Traditionally, fruit were drenched using the same solution more than once. This recycling drench also spread fungal spores that cause fruit decay, so a fungicide was added to the solution for grey mold and blue mold. As an alternative to the recycling drench, varieties such as Cortland may be drenched in the orchard with a nonrecycling drench. Do not add chloride to a nonrecycling drench since it will burn the fruit skin. The small volume of DPA solution used in a nonrecycling drench will reduce the efficacy of fungicides, but the need for a fungicide in nonrecycling drenches has not been clearly demonstrated. Another method of application involves fogging or by aerosol. Thermofogging DPA and fungicides circumvents the problem of solution disposal and is as effective as a recycling drench for preventing superficial scald. 1-Methylcyclopropene (1-MCP) is a relatively new postharvest chemical that interferes with ethylene, the naturally occurring plant hormone that stimulates ripening in many fruits. 1-methlycyclopropene allows storage operators to more tightly control the progression of ripening so that fruit quality can be maintained for a longer duration. When combined with cold storage or controlled atmosphere storage, it can prevent quality loss and disorders for a longer duration than cold storage alone. The commercial formulation, SmartFresh®, is currently widely used on stored apples. Smartfresh® can maintain the crispness of apples, but works better when fruit are harvested before they are fully ripe. Because McIntosh produces high quantities of ethylene soon after harvest, it should be treated as soon as possible and preferably within three days of harvest. SmartFresh® is effective in preventing superficial scald in most varieties. Therefore, DPA is not needed, except for the variety Cortland. Controlled atmosphere storage can lengthen the storage life of some apple and pear varieties by several months. Controlled atmospheres (CA) slows ripening and maintains firmness, but also inhibits some flavor development. Sweetness and tartness are preserved to some extent by the use of CA, but other flavors may be lessened in CA-stored fruit. By lowering the oxygen in an air-tight storage room, fruit respiration is reduced and fruit quality can be maintained. The carbon dioxide concentration is typically allowed to rise, as well, and this contributes to quality maintenance. Oxygen is an essential ingredient in respiration. By reducing its concentration to a very low level, respiration is slowed to the point where the condition of the fruit changes very little. During respiration, fruit give off carbon dioxide, which builds up in a sealed room and also contributes to the slowing of ripening. The necessary equipment adds considerably to the storage costs of apples and pears. The normal oxygen concentration of air, 21%, is reduced to 1 to 3% by flushing the storage room with nitrogen gas. Specialized nitrogen generators and liquid nitrogen are two methods of flushing a room. If the oxygen level drops below 1%, fermentation is likely, and will impair fruit quality. Good air circulation prevents the occurrence of areas in the room with oxygen concentrations that are too low. The fruit consume oxygen and decrease the concentration to below optimum if air circulation is poor. Bins should be arranged to allow air movement. A leaky storage room leads to above optimum oxygen and poor maintenance of fruit firmness. Some varieties have less tolerance for low oxygen storage and should not be placed in rooms with less than 2% oxygen. Where several varieties will be stored together in one room, maintain oxygen and carbon dioxide at levels suitable for the most sensitive variety. Fruit sensitivity to low oxygen varies with variety, maturity at harvest, and conditions during the growing season. 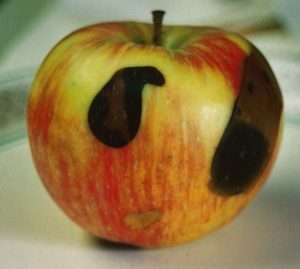 Carbon dioxide toxicity in an apple peel. Carbon dioxide levels need to be maintained below a concentration of 3% during initial stages of storage, and in the case of fruit treated with SmartFresh®, 1% or lower is needed. When carbon dioxide is too high, browning disorders of the skin and flesh occur that make fruit unmarketable. Carbon dioxide can be removed from the atmosphere by specialized scrubbers or by placing bags of hydrated lime (calcium carbonate) inside the room. Bags lined with polyethylene need to be punctured in order to absorb carbon dioxide. To adequately maintain carbon dioxide levels below toxicity, the room should have 0.6 lbs. of hydrated lime for every bushel of fruit (0.6 kg of hydrated lime for 100 kg of fruit). Honeycrisp apples are very sensitive to high levels of carbon dioxide and are considered at risk in CA storage. To maintain optimum atmospheres, a gas analyzer is needed to routinely measure concentrations of oxygen and carbon dioxide. The application of SmartFresh® increases the sensitivity of apples to carbon dioxide. Maintain carbon dioxide below 1% in rooms that have fruit treated with SmartFresh®. Air circulation is critical with SmartFresh®. The decision to install a CA room is usually based on the needed duration of cold storage. For fruit that will be marketed four months or longer after harvest, CA storage can prevent losses. For varieties that soften quickly after harvest such as McIntosh, CA storage may be beneficial for shorter storage durations of two to four months. CA storage can increase chilling sensitivity in some varieties of apple. Therefore, a warmer storage temperature of 36-38°F may be needed to prevent browning disorders. McIntosh is chilling sensitive in some cases, although many storage operators have successfully stored it at colder temperatures to maintain better firmness. 1Carbon dioxide in the first six weeks of CA storage, after which concentration can increase by 1-2%. Predicting harvest date windows for apples, Blandpied ans Silsby, 1992, Cornell University, http://www.plant.uoguelph.ca/treefruit/documents/PredictingHarvestDate.pdf. Controlled Atmosphere Storage Guidelines and Recommendations for Apples, Ontario Ministry of Agriculture, Food, and Rural Affairs, http://www.omafra.gov.on.ca/english/crops/facts/12-045.htm. Evaluating Maturity of McIntosh and Red Delicious Apples, , Ontario Ministry of Agriculture, Food, and Rural Affairs, http://www.omafra.gov.on.ca/english/crops/facts/00-025.htm.